What to get a coworker for a baby shower gift can be a difficult decision. Your gift selection depends upon your relationship with the new parent, whether the gift will be from the whole office, and what your coworker has told you about their lifestyle and baby. Most people don't expect to have a shower thrown for them at work or for their colleagues to get them baby gifts. However, if you have a small, close-knit company or team it's a nice way to show your support. Work baby shower etiquette is similar to family baby shower etiquette with a few minor differences. Do I Go in on a Group Baby Gift for a Coworker? If you are planning the office baby shower, you would be the person to pull a group gift together. If you are just a guest and there is the offer to go in on a group gift, the polite thing to do is say "yes." The idea of a group gift is to eliminate any difficulty in choosing a gift on your own and show support as a team. If you go in on a group gift, you should not get an individual gift too. 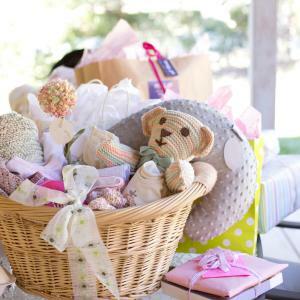 How Much Should I Spend on a Coworker's Baby Shower Gift? Think of a coworker as an acquaintance and plan to spend about $15 to $25 for a gift. This might be your share of a group gift or an individual gift from you. When choosing a budget, consider your relationship with this person and your personal finances. If you can afford to do more and want to, go for it. However, be careful not to upstage everyone else with your extravagance. Should I Buy a Personalized Baby Gift for a Work Colleague? Typically you do not buy personalized gifts for colleagues because you may not know what baby names they have picked out or even the gender of the baby. Leave the customized gifts to close friends and family members. Is Cash or a Gift Card Acceptable to Give an Expectant Coworker? The short answer is yes. Every new parent encounters unexpected expenses so gift cards are welcome. Generally, gift cards are more appropriate than cash because they feel more like a present and less like a handout. When buying a gift card, make sure it's for either a local store that sells a wide variety of baby items or a large online retailer. If I Don't Attend the Office Shower, Do I Still Get a Gift? You don't have to get a gift if you don't attend the shower. Chances are your coworker will be so appreciative to even have a work baby shower they won't be keeping tabs on who participated. If you can't attend and feel obliged to get a gift, see if you can go in on a group gift. When Do We Give a Group Gift if There's No Office Baby Shower? If there is no office baby shower, you can give your group gift to the expectant parent on their last day of work before the baby is born. This is a fun and kind way to send them off on their parental leave. Buying a baby shower gift for a colleague isn't that different from buying one for a family member. The only difference is you typically don't know coworkers as well. If you have a close personal relationship with a coworker you can get them more personalized gifts, but in general it's best to stick with standard supplies and neutrals. When the baby gift comes from the entire office, it's usually one large item. Typically a gift is chosen then one or two employees collect an equal amount of money from each contributor that covers the cost of the whole gift. Hamper full of baby linens in plain neutral colors like receiving blankets, washcloths, and bibs. If no one has organized a group gift, each office baby shower guest can either bring their own or pair up and go in on a gift with a buddy. Office baby shower gifts are typically practical and gender neutral items since you may not know a lot about your colleagues personal preferences or parenting plans. If you're not sure what to get, don't stress. Ask around to see what others are purchasing and if all else fails, gift cards are always appreciated.